The long awaited repaving of Columbus Drive is finally underway. The east bound lanes were milled this morning. Once the asphalt is removed, the rough road will be left exposed for about two weeks while utility work is completed and manhole covers adjusted. 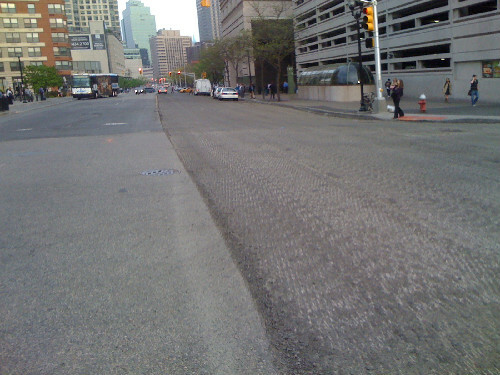 Then the street will be repaved. The simple repaving project has been long delayed by the city’s plan to expand the road into a six lane expressway. 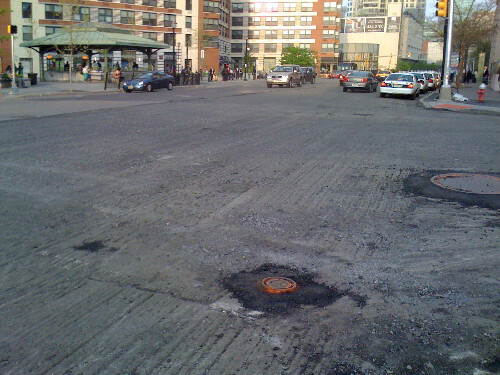 The street was widened over the last year to make room for the added volume while potholes continued to grow. When the repaving is completed, morning eastbound lanes will be expanded to three lanes eliminating overnight parking. In the evening, the westbound lanes will expand to three lanes. The original plan calls for eliminating some meter parking on Grove Street to shift the cab stand from Columbus Drive to the northbound side of Grove Street.